The Gransfors Splitting Maul can be used for splitting very thick and knotty chunks of wood. It is forged and ground to a concave, quite thin blade at the bit. The axe cuts quickly and easily into the wood and then effectively splits it as the broader section pushes apart the wood. Its weight and sturdy poll with bevelled corners make the maul perfect for striking a wedge. Otherwise, the design is similar to the Larger Splitting Axe, but with a slightly longer poll. The handle has a protective steel collar below the axe head and circular grooves towards the end for an extra firm grip. 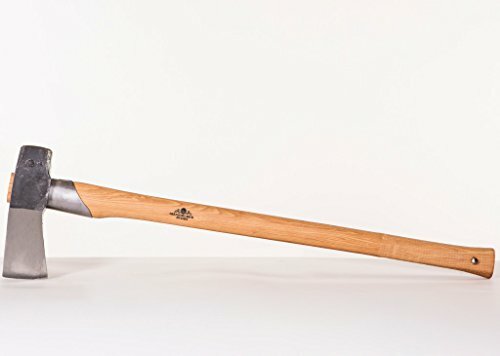 The Splitting Maul is the heaviest axe produced by Gränsfors Bruk. Comes with English language Axebook.